“The world’s first 2,000-metric-ton all-electric cargo ship has been launched in Guangzhou, the capital of Guangdong province. The ship, manufactured by the Guangzhou Shipyard International Company Ltd, represents a technological breakthrough as it is the first in the world to use lithium battery in a fully powered cargo vessel running in the inland section of the Pearl River. After being charged for two hours, the ship can run 80 kilometers, according to Guangzhou Shipyard International. The company is the mainland’s first shipbuilding company listed in Shanghai and Hong Kong, and is wholly owned by CSSC Offshore & Marine Engineering (Group) Company Ltd under the China State Shipbuilding Corporation Group. The ship, 70.5 meters in length, has battery energy of about 2,400 kilowatt hours, or about the same energy of 40 new energy cars. Its highest speed tops out at 12.8 kilometers per hour, and there is zero emission of waste gas pollutants. “As the ship is fully electric powered, it poses no threats to the environment. 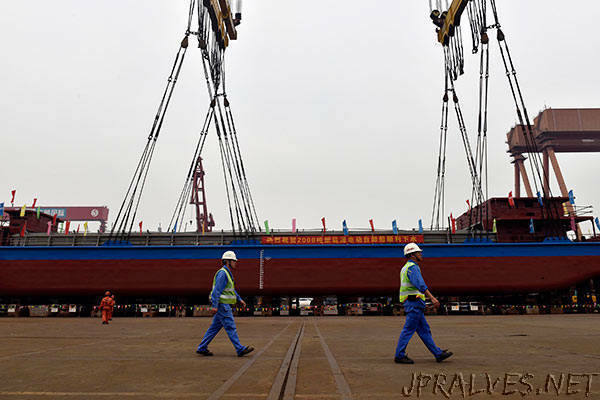 The technology will soon be likely … used in passenger or engineering ships,” said Huang Jialin, chairman and general manager of Hangzhou Modern Ship Design & Research Co, which designed the electric cargo vessel. According to Chen Ji, general manger of Guangzhou Shipyard International, the ship will be mainly used to run in the inland section of the Pearl River, carrying coal for the generation of electric power. According to Chen, use of the new-energy cargo vessel would help greatly reduce shipping costs for electric power operators. “The cost of electric power is less than that (of) traditional fuel. The main cost of the new energy cargo ship depends on how much lithium battery it is equipped with,” Chen said. According to Chen, the ship was built on a base of a series of new technologies and solutions. “Theoretically, the fully electric-powered ship could have more capacity in cargo loading. If it is equipped with larger energy batteries, it will carry goods of more than 2,000 tons,” Chen said.